I like characters and I like the way the story is going. One thing I hope is that it's not a romantic love story between Tsukushi and Jin. I think they're great friends who get along in a brotherly way. I liked the action scenes and how well it was relatable. I played soccer in high school too and that shuttle run scene. It brings back some hard but rewarding memories. TLDR Version: Emotionally powerful sports story void of tactics. Paced way too fast. Nice characters, so-so animation/art. Why does he have rose cheeks? I love soccer (and play) and I usually like most sports animes. That combo has me really enjoying this one! It's got brotherhood, growth, drive & determination; and hard work all well represented. The humor is good and the characterizations well defined and enjoyable. Fun! I love this anime omg. I just hate I cant binge watch it like I did with other sports animes. A sports anime with heart. I fell in love with this anime from episode 1. Tsukushi is one of the most adorable protagonist's I've come across, even beating out my sweetie Onada from Yowapeda in cuteness. Despite being a sorely lacking newbie to soccer, he's full of heart, dedication, and purity, and anyone that meets him is changed forever, especially his teammates. I've read the manga as well, and the anime is keeping pretty true to it, changing only a few things here and there - for the better in my opinion. 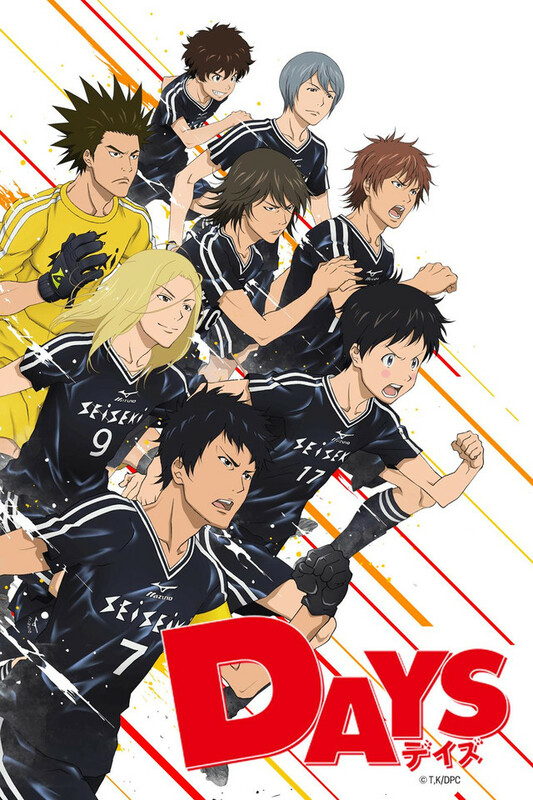 So, if you want to watch a sports anime that inspires, lifts your spirit, and makes you root for the underdog with an excited smile, then DAYS is the anime to watch.